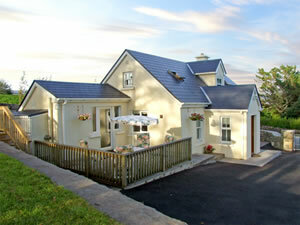 1 Clancy Cottages in Ireland West a perfect base for your holiday in County Galway. Find out more about 1 Clancy Cottages below. This unique property is a comfortable cottage that dates back to 1800, which has been refurbished to a high standard and provides accommodation for up to five people. This charming cottage dates back to 1800 and has been carefully refurbished to offer the visitor the convenience of 21st Century living, whilst retaining its original character. The well-equipped bright kitchen has a generous dining area and is on semi-open plan with the welcoming sitting room with its oil burner, which gives the room a cosy feel. There are three bedrooms, and they are tastefully decorated in keeping with the cottage with warm natural materials. The shower room is on the ground floor, and outside there is a fabulous decking area with furniture, perfect to sit and watch the world go by, and a large lawn with plenty of space for family games. This is a superb property for a relaxing holiday in this area. Oil central heating with oil burner in sitting room. Electric oven, hob & grill, microwave, fridge, washing machine in utility room, TV, DVD player, radio/CD player. All fuel & power inc. in rent. Bed linen & towels inc. in rent. Cot & highchair available on request. Off road parking for 2 cars. Lawned and decked area, with garden furniture. Sorry, no pets & no smoking. Shop & pub 5 mins walk. 1 Clancy Cottages is family friendly self catering. We have the following details listed regarding 1 Clancy Cottages accommodation accessibility but we would recommend that you always confirm these prior to booking with the owner or operator. 1 Clancy Cottages is a great base to explore the wonders of County Galway and you will find plenty of activities near by. 1 Clancy Cottages is at Kilkieran, County Galway. Check out the map below for directions, use the controls to zoom in. If you have stayed at 1 Clancy Cottages why not add your thoughts, comments, pictures to our Facebook page? Don't forget to add the name/town/page link to your comment so its attributed to the correct place. Please keep it polite, we are sensitive souls! Find Cottage Holidays works closely with independent cottage owners and leading holiday travel operators to provide you the widest choice of self catering accommodation across Ireland. 1 Clancy Cottages in County Galway is available through: Sykes Cottages. Stayed at 1 Clancy Cottages?